Anti-Mullerian hormone (AMH) is a member of the transforming growth factor-beta family, which mediates male sexual differentiation. Anti-Mullerian hormone causes the regression of Mullerian ducts which would otherwise differentiate into the uterus and fallopian tubes. Some mutations in the anti-Mullerian hormone result in persistent Mullerian duct syndrome [provided by RefSeq]. 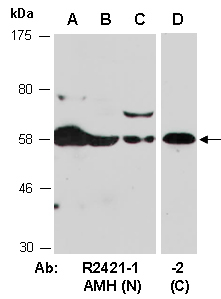 Rabbit polyclonal antibodies were produced by immunizing animals with GST-fusion proteins containing either the N-terminal [AMH (N) (R2421-1)] or the C-terminal [AMH (C) (R2421-2)] region of human AMH. Antibodies were purified by affinity purification using immunogen. regions of human AMH at RT for 2 h.